Within a world of greenest cities, transportation priorities and capital funding will need redirection. Street space will need reassignment. Transportation priorities will need realignment to favour walking, cycling, transit, inter-city public transportation, movement of goods, and lastly only cars. Today: Pacific and Burrard Streets. Vancouver, BC 2010. 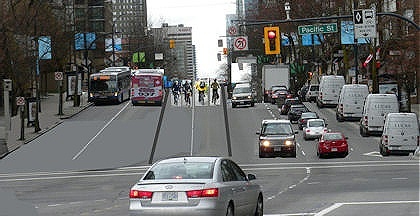 Concept: today's traffic carried by cars becomes tomorrow's faster-transit and cycling traffic. Simulation mockup by J. Becker. The role of trucks within an urban fibre will need to be re-examined. Inter-city trucking may need to be rationalized and limited to goods not transportable by rail. Intra-Metro trucking may need to be revisited. Distribution systems may need to be based on least distance travelled to primary markets with less suburban based operations. Large-size truck distribution patterns may need to be repositioned to smaller, green powered trucks. Greenest cities may need to refocus their transportation mode share targets. Car share may need to be set at levels attained by Copenhagen, at 27%, or Amsterdam, at 30%. Cities like Vancouver, may wish to set their targets a bit more conservatively at 35%, as a first step. With such direction, capital transportation funding will need to be redirected from road, bridges, and highway construction to supporting greenest transportation modes – walking, cycling, urban transit, and inter-city public transportation. 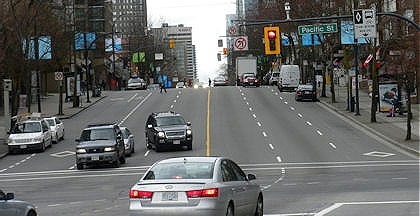 With such direction, urban form and density will need to be refocused towards densification which creates traffic to warrant and support greenest transportation modes and discourage densification which requires the use of cars to go to work, school, shop, or for other family or personal business. Streetscapes may need to be realigned towards greenest transportation and people spaces. On-street car parking lanes may need to be replaced with off-street short term parking capacity within greenest city urban form. Portugal Minister of Public Works. “Portugal Cuts Road Projects After Economists Say They Do Not Help the Economy”. Mar. 18, 2010. “There is a need to rethink the country’s transport network on a multi-modal basis.” “….Government’s intention to continue with major investment in high-speed rail”.